Modern web applications suffer from a huge code and resource bloat. The page is downloading megabytes of stuff, while the screen stays blank for 10s of seconds - not a good experience! An alternative - a feather app, that comes in at less than 10KB minified and gzipped (25KB without gzip), certainly looks very very attractive. The app's author Henrik Joreteg built the application up from nothing - only adding the code when a feature was needed, without including the unnecessary parts. I like Cycle.js - a honest reactive framework that is extremely powerful. Yet a simple program made with Cycle is quite large - it includes the Cycle framework itself (very small), virtual-dom and RxJs v4 as of this writing. All these libraries are very powerful, but their sizes add up. This Cycle application, unminified takes up 591KB of space. It works - we can open index.html and increment the counter using buttons. You can find this code, including the built code inside dist/ using at the Git tag v1.0.0. "original": "npm run babel-original && npm run uglify-original && npm run gzip-original"
This is what we want to beat: 199KB minified and 50K gzipped bundles. We are going to do this by eliminating code portions that are truly unused in our small application. Let us determine what parts of the application's code we are actually using when we run the example counter program. We cannot use the static analysis, like Rollup does during tree-shaking - every part of RxJs, and virtual-dom libraries is reachable from code. What we need is code coverage while we run the application to determine if there are parts of the built bundle that are never exercised! I have done the code coverage for running web applications before using was-tested code coverage proxy. Let us add this proxy and instead of running the example application directly access it via the proxy. Instead of opening the example HTML page directly, we will serve it using simple static web server. Then from a separate terminal we will start the code coverage proxy. The proxy will instrument by default requests matching app.js$ pattern coming back from its target url. The code to setup the streams and start the processing is only executed once. That is why we can use const keywords to declare every variable in the program. Only the data inside the streams will be changing when the program runs. Some callback functions are not covered because they did not execute yet. For example, converting from clickin "Add" event to "1" has NOT been executed yet, because the user has NOT clicked the button yet! 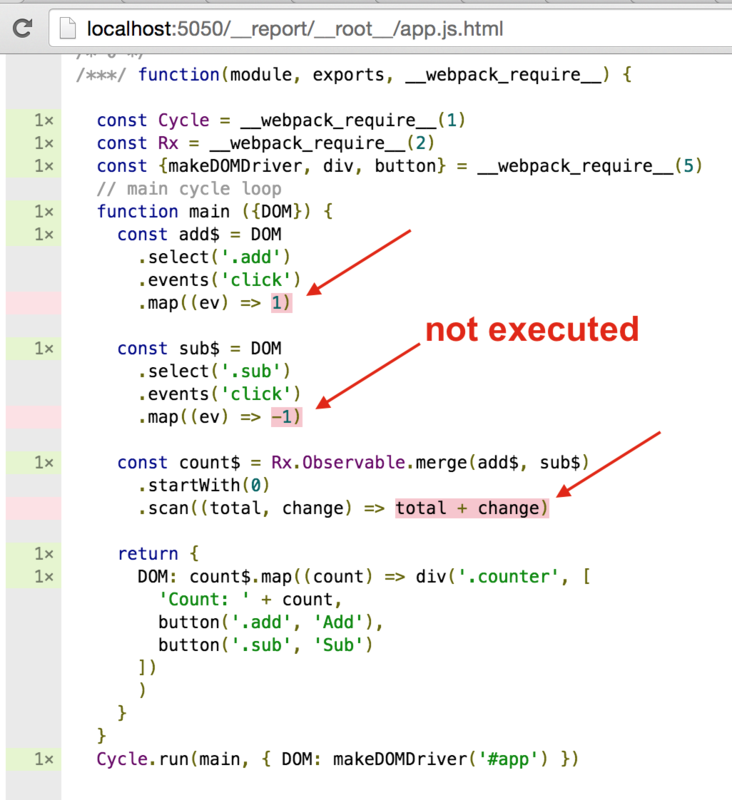 Similarly, the scan callback has never executed, because there were no events in the merged stream. If we click on "Add" and "Sub" buttons several times, the coverage will change. Notice that the number of times scan callback (which functions as our "model update") was executed is equal to the sum of number of times "add$" and "$sub" stream callbacks ran. The code only uses function add, thus we should remove sub to save space / shorten the bootstrap time. Under Node, we can generate code coverage information quickly using nyc instead of was-tested proxy. I picked functions as the smallest blocks of code, because removing individual code lines or branches might introduce completely unpredictable and hard to test behavior. Functions on the other hand (with at least single covered line inside) are safer to remove. Consider the example below. On the right the comment shows number of times a particular non-empty code line is executed. Every function declaration line is executed as soon as the function definition is processed. The inside lines of a function are only executed if the function is called. Since the function add is never called, the inside line return a + b has counter 0. Function abs shows the dangers of removing lines from inside a function, even if the line is uncountered. We only exercised the positive branch, removing the negative branch return -a would leave the function in a very dangerous state. Thus we will only remove the functions that are never called at all, even once. Under the hood, nyc uses istanbul code coverage library, same library as used by was-tested. Thus the output coverage file is the same. It has information for each function: start location and if it was used or not. The functions are listed in order found in the source file. The above coverage file shows that the code inside the first function add was executed at least once, while the second function sub was never called. To remove the uncovered function from the code I wrote fn-shake.js. It loads the source code, parses it using esprima and then walks the abstract syntax tree. For each found function declaration, it looks up the coverage flag. If the function is NOT covered, it is removed from the tree. Let us apply the same "shaking" algorithm to the generated Cycle application bundle. Not every function that was unused could be removed. For example, even if a function is not used, we cannot remove add without removing all references to it. While no one has used new Item anywhere in the bundle, we could not just remove the constructor function as the removal was breaking assigning to the prototype. Thus (initially) I had to keep a bunch of functions, even though the entire code fragments were not used! Most of the code blocks not removed came from RxJS library. Still the automated process has been able to remove about 270 unused functions, while the application still worked as before. The application shrank by about 20% in the uncompressed source code, from 491KB to 414KB. Once the automatic coverage + elimination step finished (removing almost 600 functions from 2000), I got a bundle that was smaller. 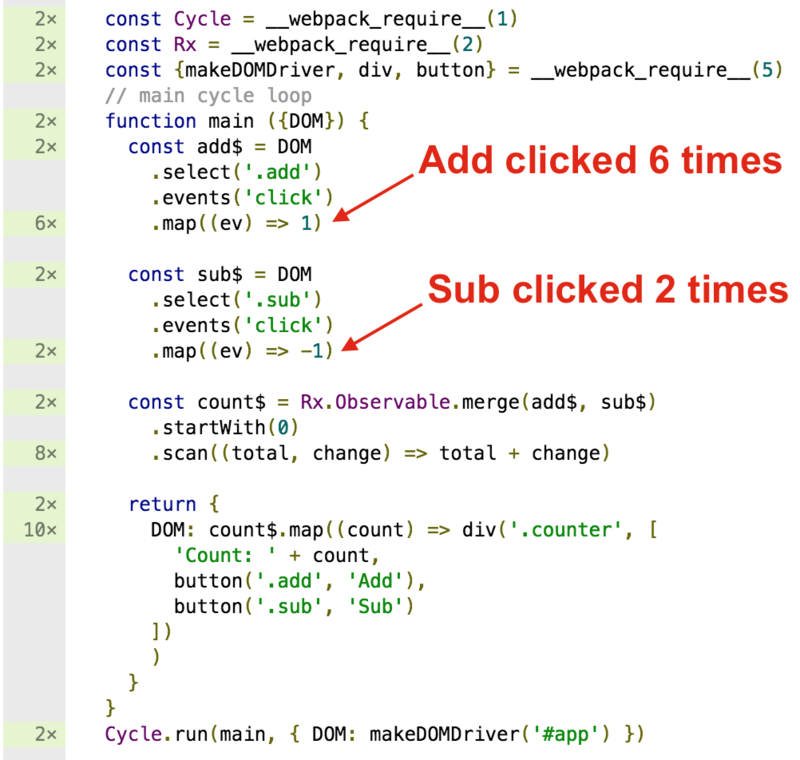 Running the same ES6 bundle -> ES5 bundle -> uglify2 -> gzip steps generated the following bundles. Thus minified bundle went down from 199KB to 141KB (29% decrease) and the gzipped file went down from 50KB to 38KB (24% decrease). The smaller bundle has the corresponding shorter evaluation period - only 100ms. Smaller file, shorter download time and faster application startup time - what not to love? I feel there is still room for improvement, especially in completely removing any unused prototype functions. I also believe that new tree-shaking approach possible with ES6 code analysis will be very very beneficial once all the libraries used in this experiment support ES6.